Both of those were tossed out frequently as an excuse for the condition of an office that I’d been called to whip into shape. I found it interesting that the reason the person called me was so often not the real reason they needed assistance. For example, they might call saying they were behind in paperwork, but I’d soon find the real issue was their bottom line wasn’t where it should be. They’d missed bidding on a job, didn’t follow up on inquiries, had accrued late fees because they forgot to pay bills and didn’t meet deadlines for a variety of reasons. 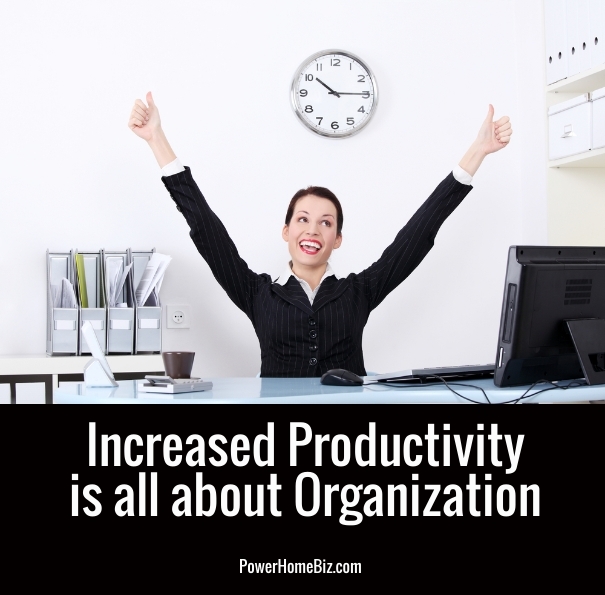 Ultimately, increased productivity is tied to organization. 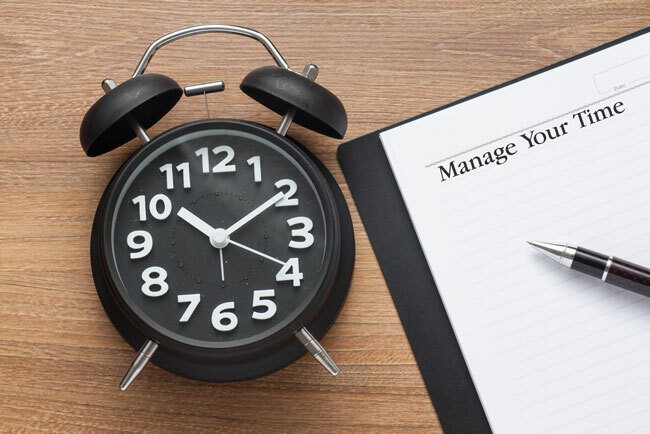 How well you do or don’t track projects, materials, paperwork, to-do lists and manage your time is going to be reflected in how will your business is doing. If you want to see your productivity and revenue increase, then you need to be organized. The problem with “I’ve been meaning to get that straightened out” or “I thought I’d organize it when I had time” is that things only are so much worse when you wait. The longer you wait, the longer it takes, and the more chance you’ll think you don’t have time to deal with it. Everything did not get disorganized overnight, so don’t expect to organize it all at once. Instead, pick and area and focus on fixing that area. Then, work to keep that area organized as you approach another one. Here are some of the things I’ve found most often need attention in offices and small businesses. Face it. Your business is full of stuff. 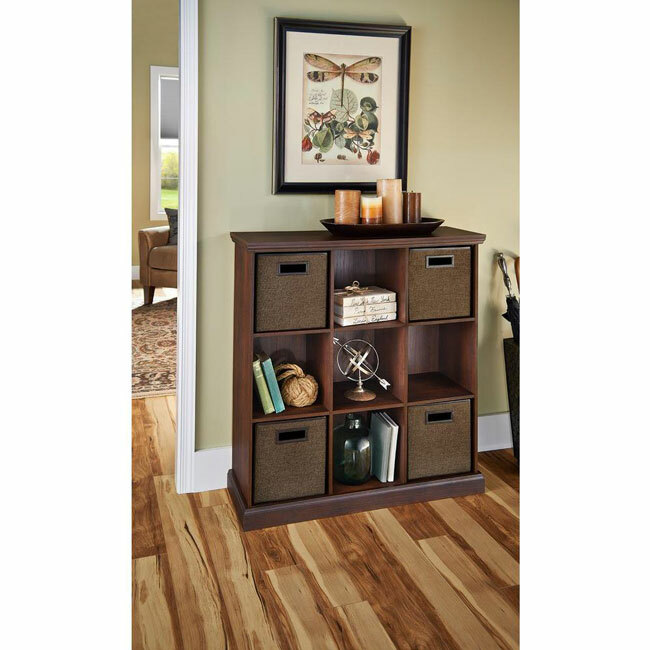 Most likely you have products, supplies and materials that need to be organized. The more they are in disarray, the more time you spend searching for what you need. When this happens, you are likely to miss deadlines or fail to meet customer expectations. Try these tips to get started on getting everything in place. Sort items by like kind. For example, put all the mailing supplies together. Put all the product samples together. Put parts or pieces together in one spot. Declutter as you sort. If it is outdated or just not useful, set it aside to donate or sell. Create permanent storage. Think of professional solutions, because this is not a temporary problem. If you don’t have behind-closed-doors storage, then create attractive storage for out in the open using cube shelves and leather or linen cube totes. For visible storage, use premium materials. For hidden storage, choose clear plastic so you can easily see what and how much is stored. Add labels. Label both the shelf and the container. This means more than one person can use the system. It also helps ensure that items get returned to the right spot. If adhesive labels won’t hold or are not the look you want, tie label tags onto the bin handles. As much as we’d like to imagine a paperless business, it is pretty hard to turn off the paper faucet. In my own company, I pay bills online that I’ve received electronically. This doesn’t seem to stop the piles of statements and marketing materials that appear in my mailbox. Without a paperwork routine, piles of papers will continue to grow until it becomes a mountain you think you can’t climb. Getting control of papers is not only a time saver, but a stress reliever. Begin with today. Always start cleaning up piles of papers by first sorting the most recent materials you have. If you begin with the old stuff, the new papers will keep arriving and the more you dig, the more the pile grows. You just don’t catch up. You have to stop the piles from growing by not adding to them today. Create “in” and “out” baskets. Each day, empty the in basket and put things away. Make sure the papers in the out basket are delivered. Sort materials. Use categories: things to do, things to read and things to file. Create a to-do list. As you sort, you’ll find things you need to do. Add them to a to-do list and keep on organizing. Work with portable plastic file crates. Temporarily sort your backlog of papers to be filed into the crates. They are light and easy to move so you can work on the project for a while, set them aside and then go back to them tomorrow. Store them away. Once you’ve sorted all the materials, move them into file drawers or project boxes to be stored away. If you are not hunting for papers, you are probably hunting for electronic files. Who hasn’t sent an email to get a copy of a file they know they have…somewhere? Keeping your computer organized is certainly a time saver. Here are a few electronic-related tips. Create computer folders. Use the same file name on your computer as you do in your file cabinet. If the company is labeled Smith Electronics in your file cabinet, then it should not be labeled John Jones, the manager’s name, in your laptop. Make sure your contact list and all files match. Divide. Just like you can’t cram all your files into one file drawer, don’t try to jam them all into one computer file folder so you are endlessly scrolling to find something. Break them into smaller categories. Sync. Find out how to sync your phone and your laptop so you are not constantly shifting from one to another. Use the cloud. Use a cloud for back-up. This way you can access materials at all times from work, from home, from meetings or on the road. Getting and staying organized doesn’t happen when you get around to it. Likely, if that is your plan, you’ll never get around to it. Organization is a task that will save you time and make you money. It’s a worthwhile investment. Make an appointment. Block out some time to get organized. You probably can’t give up a whole day, but I bet you can carve out a couple of hours here and there. 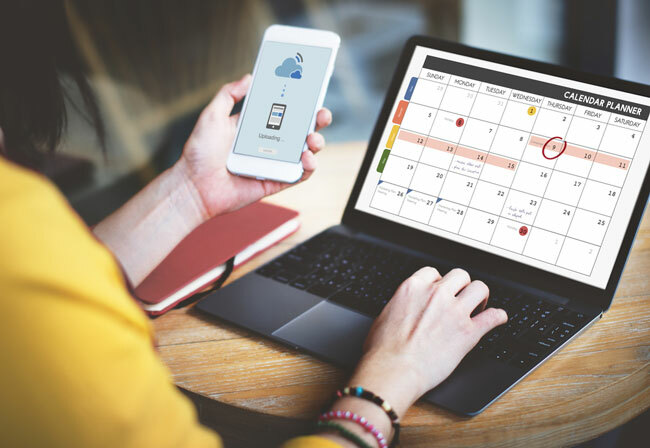 Grab your calendar and make an appointment with yourself. Make a list. Write down what you most need to organize. Work your way through the list. As you finish something, work to keep it organized. Get a routine. Create a routine you can stick to. Perhaps every Friday morning you put away the week’s files. Maybe every Monday you start the week with a clean slate by decluttering your office and putting anything out of place back where it belongs. Analyze your time. Most often, anything we do spur-of-the-moment doesn’t get our best effort. Figure out aspects of your business that have not been getting your full attention, such as social media management or marketing, and block out a specific time to work on them. Set up goals to meet so it becomes a project you can manage. There are a zillion ways to organize physical space, things and time. That is a great thing to keep in mind as you work to be more productive. Try something new. If it doesn’t work for you, don’t revert back to being disorganized. Instead, try something else until you find a system or routine that really works for you and your job.